With the financial crisis continuing after five years, many question why economics failed either to send an adequate early warning ahead of the crisis or to resolve it quickly. This book, edited by Diane Coyle, examines what economists need to bring to their jobs, and the way in which education in universities could be improved to fit graduates better for the real world. Declan Jordan praises the work, concluding that it is likely to prompt many debates and inform many course review meetings. What’s the Use of Economics? Teaching the Dismal Science after the Crisis. Edited by Diane Coyle. London Publishing Partnership. September 2012. Diane Coyle has done more than most economists to explain to the general public just what it is that economists do and why economics matters. Her 2007 book, The Soulful Science, is, for this reviewer at least, the best treatment for a lay reader of the key ideas in modern economics. Since that book appeared however, economists and economics have gone through something of a crisis of confidence. Diane Coyle now edits a collection of essays on the state of the discipline from a very impressive group of contributors including economists from academia, government bodies, private organisations, and the media. What’s the Use of Economics? 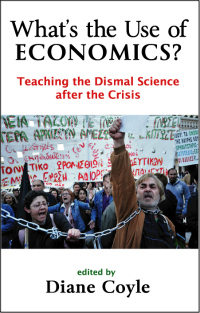 Teaching the Dismal Science after the Crisis is a very important and timely book, which draws on contributions to an international conference in February 2012 organised by the UK Government Economic Service and the Bank of England. For anyone involved in teaching economics the calibre of the contributors alone makes this book worthwhile, but it is the quality of the papers that makes it required reading. Considering the challenges for the economics profession posed in these papers will make us better teachers and improve the learning experience of our students. The book is presented in four parts. The first considers what employers of economists want in a graduate. This is followed by two sections on what it is that economists do, in the second part focusing on the methods we use and the third part on the practice and teaching of macroeconomics. The final part presents proposals for the reform of undergraduate economics courses in response to the crises in the economy and economics itself. The consensus emerging from the first part of the book on what employers require is hardly surprising. Indeed, it seems that what employers want are more skills that are not necessarily economic; these are communication, critical thinking and the ability to take a wider perspective. There are repeated calls for the reintroduction of or a greater emphasis on economic history and the history of economic thought in economics programmes. Dave Ramsden, head of the Government Economic Service and Chief Economic Advisor to HM Treasury, who, I suspect, has hired quite a few economics graduates, makes the obvious point so often forgotten by the academics that deliver economics programmes that most economics graduates look for and find jobs outside of academia. The types of skills most desired by their employers are not necessarily the types of skills possessed by academics themselves. In the final part of the book several approaches are set out to teach these skills or to help students develop these skills themselves. Many teachers will find inspiration for course development in the papers in that section, particularly in Jonathan Leape’s impressive presentation of a multidisciplinary compulsory course for undergraduate students at LSE. Although all of the papers raise very important issues for the discipline and how it is taught, the papers that most surely hit home are those that challenge some of the more drastic diagnoses for the discipline. David Collander of Middlebury College presents the most challenging argument in the first part of the book when he says that the “problem is not that economics is too mathematical; it is that the mathematics we use is too simple”. He also cautions against the widespread reintroduction of history of thought courses for the persuasive reason that, since we have not taught these courses seriously for decades, there are unlikely to be enough quality teachers of them. He also argues that curriculums should not be set from the top down, but rather each institution must blend the skills available in its own faculty. As he memorably puts it “what needs to be taught can only be decided by the boots on the ground, not in castles in the air”. Ed Glaeser of Harvard University argues that “while economics has many failings, the core system is not broken”. He argues that PhD programmes generally do a good job of producing smart economists with the skills to do economics, and that these will develop wider experience, including policy experience, over time. He says that if more policy relevant research is needed it is up to policy makers to fund that research and/or provide opportunities and incentives for young researchers to engage with the policy debates. The book is not without limitations, though these are mostly sins of omission to which it could be argued that the omissions are beyond the book’s scope. For example, even though the book ostensibly presents the demand-side perspective in the first part when considering employers’ needs, there is no challenge to the stated versus revealed preferences of employers. While there is a lot of self-criticism and reflection on the part of academic economists about why they failed to prepare students properly for the crisis, I think the role of employers in government, banking and other private sectors must also be put in the spotlight. For example, would a bank really have wanted a critical thinker to have pointed out the folly leading to the crisis? We can look to the ample evidence in Ireland’s case that many professional, private sector economists were little more than cheerleaders for the bubble economy and any attempt to warn about overheating or a downturn was met with derision, most notably by the Irish premier who wondered in 2006 why those who were always moaning about the economy didn’t just commit suicide. The book is highly recommended. The challenges it presents are being debated in economics faculties across the globe. The current crisis has shifted the certainties of orthodox macroeconomics and emboldened those who argue for a stronger emphasis on behavioural approaches and less emphasis on mathematical and statistical methods. This struggle will persist and this book is likely to prompt many debates and inform many course review meetings. Declan Jordan is a Lecturer in Economics in University College Cork (UCC). He holds a PhD in Economics and his research interests include business innovation, regional development and competitiveness, economic growth, human capital and education. He also has substantial management and corporate experience gained prior to joining UCC. He blogs at www.declanjordan.net and tweets as @decjordan. Read more reviews by Declan.